I'm not the type of guy who takes tons of bodybuilding supplements. At least not these days. One of the reasons why is in the past (when I was in high school, in the 90's! ), I would be a sucker to all the latest advertisements in Muscle & Fitness, Flex, Muscle Media 2000 and other popular muscle magazines. Those advertisements contained “information” about the latest pills or powders that promised faster gains. The results from those ads were backed up by before-and-after pictures, statistics, charts, numerical results (which probably made up by marketers) and pictures of a then-famous bodybuilder (who probably made their gains from other “supplements” other than the ones they were promoting). Sometimes, there would be an “advertorial” beside the magazine ad. For those who don't know, an advertorial is basically an advertisement disguised as editorial content. Since the advertorials looked like an article in the magazine, it seemed like the content itself was legit and didn't have any underlying agenda (like priming you to buy supplements). I was still young, gullible, lacking in critical thinking skills and impatient at the time and was seduced by clever advertisements. Also, back then, information wasn't as readily available today, so doing “research” on different health supplements or ingredients was a bit more difficult. I was heavily influenced by these muscle magazines and their advertisements, and I spent more than I would care to admit on various pills and powders that produced no desirable results. This habit of reading muscle magazines, being exposed to advertisements, buying supplements, then working out created an inadvertent dependency to have some sort of supplement before embarking on any sort of training. In the past, working out with weights was always on and off. I would usually workout, get some mediocre results, plateau, get bored/frustrated/injured, stop, lose gains and then the cycle would repeat. Whenever I got “on” again, I would have this need to find some protein powder, weight gainer, or something else to ensure that I'd make the most use of my time. I was so sold on supplements (much like many people today) that I couldn't justify lifting weights without taking anything! I thought supplements would maximize my results from working out. Well, turns out that I spent probably thousands of dollars on bodybuilding supplements without making any meaningful progress. Again, keep in mind this was late 90's early 2000's. It wasn't until about 10 years later, when I got serious about strength training and getting as strong as my genetics will allow me to, that I decided that I was going to actually TRAIN and make my gains naturally (“natty”, I think that's what kids call it these days). In other words, I was only going to eat food and train hard. I deliberately resisted the temptation to take any sort of bodybuilding supplement in order to workout again. That was pretty easy, because at the time, I was living in Bangkok and nutritional supplements for bodybuilders aren't as popular as they are in Canada. Plus, at the GNC store located inside the mall Central Rama III, the protein powders was about 3 times the cost as it was back home, so my money was better spent at buffets and various restaurants. Turns out that I proved to myself that you don't need bodybuilding supplements to make progress! (duh). I ended up joining the 200/300/400/500 club (pounds lifted for 1RM for the OHP, bench press, squat and deadlift respectively) while training at Fitness First in Bangkok while only eating real food before making my way back home to Canada and experimenting with supplementation again. I'm pretty jaded about bodybuilding and nutritional supplements because of my history of wasting money on them. Combined with the fact that I made more progress with FOOD and structured training, and knowing that the supplement industry is pretty much unregulated and full of snake oil sales companies, I'm VERY skeptical of claims about any sort of supplements. I'm generally unwilling to try out the latest pills or powders (unless it’s free), and would rather spend money on buffets than supplements. But I still take some things. I guess I'm not natty now. Creatine is pretty heavily researched, works for me (based on “did my lifts go up since taking creatine?”), convenient and cheap. Whey protein powder is cheap if you buy in bulk (by the way, it seems like the more advertising a brand of protein powder has, and the more cool-looking the design of the container label is, the crappier and more expensive that protein is), very convenient to ingest and store for long terms, and makes my coffee taste better. Melatonin seems to help me sleep better (better sleep, better recovery, more gains imo), is cheap (and available over the counter in Canada), and is backed by a bunch of research. Multivitamins and fish oils are stuff I take just in case I don't get enough. To be honest, I don't think it'll make much difference if I stop taking them. I probably go to a sushi buffet often enough that I don't need fish oil. But I take it...just in case. Caffeine and ephedrine aren't really nutritional supplements, but they're stimulants to keep me alert. I sometimes stack it with protein and creatine and drink it during my workout so I don't feel so tired after my training session. The thing is, I don't want to spend my time toiling through pages of research that I don't understand to try to figure out if something is backed by SCIENCE. And I don't know about you, but I am not a scientist, and I’m not trained to properly read scientific studies. I’m sure most of those who reference PubMed on internet forums aren’t either. The whole process seems pretty damn tedious if you ask me, and I'd rather be lifting weights and crushing PR's than reading stuff I don't fully understand! If I was a billionaire, I'd hire a bunch of geniuses to do the research for me, and tell me what’s good and what’s not so good in a way that I can comprehend easily. Good thing I don't have to. Thankfully, the website Examine.com that has a bunch of eggheads qualified experts (who probably spent a lot of money on their education and have more letters after their names than I do) who did the research, and summarizes their findings in an easy to read (and understand) format. It's like a Wikipedia for supplements. Typically, any information on supplements would lead to some sort of sale or recommendation of a product that contains that particular ingredient(s). For example, if you take a look at articles pertaining to creatine on BodyBuilding.com, you'll find various links within the article that goes to a page that sells creatine supplements. That's how they make money. To be honest, I initially found it weird that they don't shill different supplement products because they would probably make a tiny bit more money via affiliate sales. But when you think about it, it makes sense because they position themselves as an “independent organization that presents un-biased research on supplements and nutrition”. They only provide information: via their website, “Supplement Goal Reference Guide” and their “Stacks Guide”. The website itself well-organized, browseable and searchable based on the ingredient. 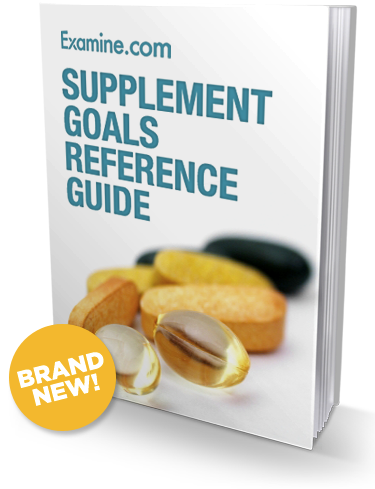 The Supplement Goal Reference Guide is a book with details on various supplements describing what works and what doesn't based on peer-reviewed scientific studies. The Supplement Stacks Guides covers what combination of supplements work (and don't work) for certain goals, such as Testosterone Enhancement, Fat Loss Muscle Gain & Exercise Performance etc. I wish they did some sort of laboratory testing of a variety of products to determine if what's on the label is actually what's in the container, and not just some filler ingredient(s). I remember reading or hearing somewhere that there's an inverse correlation with the amount of supplements a person takes, and how strong/aesthetic/muscular etc. they are. I think that's partially true. I observed this phenomenon in real life at commercial gyms, and have experienced this myself. In my opinion, I think that people (novices, specifically) should train and not take any bodybuilding supplements until they made some decent gains on just food and hard work while following some sort of structured program. This will teach them to focus on training, food, and recovery which will contribute to the bulk of their gains. Only once they hit some decent progress, then experiment with supplements to see if whatever they're taking will actually work for them. But even then, the focus should really be on the PHUNG-dementals: training, food, and recovery (aka sleeping). Again, this is my biased opinion based on my history of being overly reliant and spending a lot of money on supplements before realizing that most gains are a result of training, food and recovery. But if you're going to take anything, it's best to do your research first and take a look at an unbiased, reputable source like Examine.com to find out what works and what doesn't before opening up your wallet.